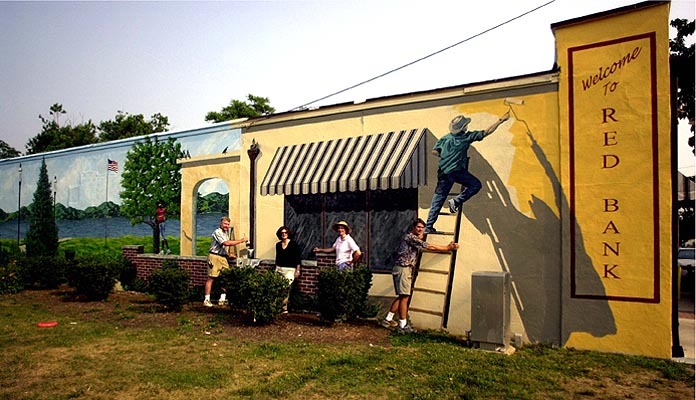 .This mural is in Red Bank , NJ. on the corner of Shrewsbury Ave and Drs. Parker Blvd and was finished on the 4th of July 2002. It was a State funded project for The Neighborhood Preservation. In this picture you are seeing about half of the 130' x 14'. On this end we really utilized shadows to create the 3D effect, as the wall is totally flat, and the awning merely mimics the one on the front of the building. While painting this we actually watched birds struggle to get into the painted trees. Passers by would come up and feel the wall to see where reality ended, and painted surface began.For a few more pictures click here.